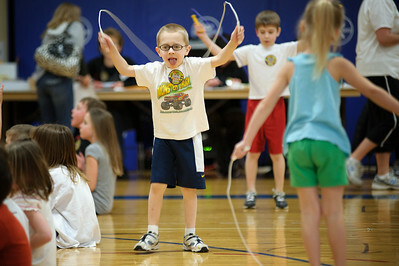 Daniel J. Murphy - dmurphy@shawmedia.com Camden Lima, 7, of Huntley wiggles his baby tooth during the American Heart Association's annual Jump Rope for Heart Wednesday March 7, 2012 at Chesak Elementary School in Lake in the Hills. Daniel J. Murphy - dmurphy@shawmedia.com Shane McGuimn, 6, of Huntley jumps rope Wednesday March 7, 2012 at Chesak Elementary School in Lake in the Hills. Chesak is one of the top fund-raisers for the American Heart Association's Jump Rope for Heart. Daniel J. Murphy - dmurphy@shawmedia.com William Papcke 6, of Lake in the Hills dances with classmates during the American Heart Association's annual Jump Rope for Heart Wednesday March 7, 2012 at Chesak Elementary School in Lake in the Hills. 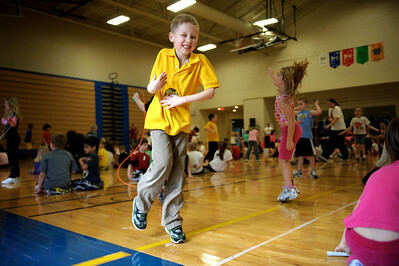 Shane McGuimn, 6, of Huntley jumps rope Wednesday March 7, 2012 at Chesak Elementary School in Lake in the Hills. Chesak is one of the top fund-raisers for the American Heart Association's Jump Rope for Heart.